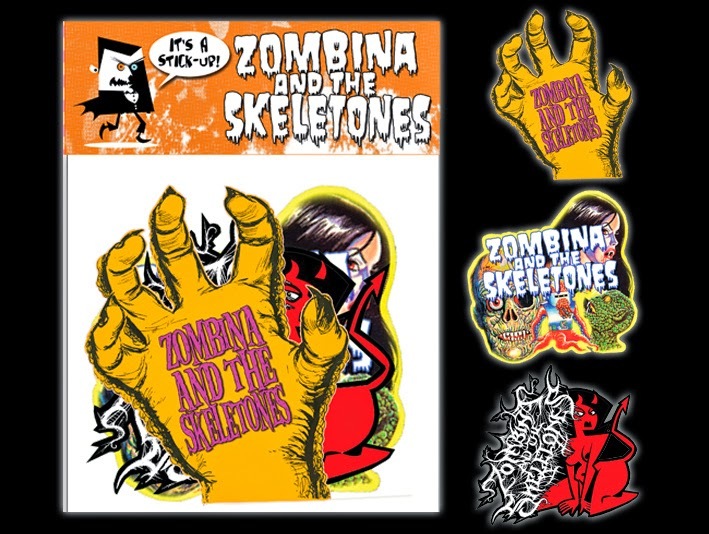 Zombina and the Skeletones: STICKERS!!! Combining the artwork of some of our favourite penmen (Christophe Szpajdel, Shane Horror, and design from Doc H and Zombina!) this sticker pack contains three 8x8cm vinyl stickers! They're waterproof, so can stick on anything your dark heart so desires, in or outdoors! GO TEAM! Stick 'em UP!!! THE ZOMBINA AND DOC COOKING SHOW! ZATS "BLACK METAL" T-SHIRTS OUT NOW! !